Tafelmusik's House of Dreams ¡! ¡! ¡! ¡! ¡! ¡! ¡! ¡! ¡! ¡! ¡! ¡! ¡! ¡! ¡! ¡! ¡! ¡! ¡! ¡! In the late 50s when I was 18, I discovered baroque music through Archiv Records. They featured composers I had never heard of and I thought that the music was as avant-garde to my ears as my favourite American jazz. In 1972 when I was teaching at a high school for rich kids in Mexico City I was asked by one of my students (and during class which made it all that much more embarrassing), “What to do you think of Alice Cooper?” My reply of, “No,who’s she?” garnered lots of laughter. And so we made a pact. They would listen to my music and I would listen to theirs. I was introduced to Alice Cooper, Crosby, Stills, Nash & Young and the Allman Brothers Band. My introduction of my music to the class was special. I took the class (and I asked them all to dress up) to a Vivaldi concert at a museum that used to be a baroque church in Tepozotlan, Estado de México. I don’t remember the program but I know that a very old man played the Mandolin Concerto in C major, RV 425. The conductor was a gaunt and serious older Italian. During the performance there was huge electrical storm and after a big bang the lights went out. The conductor turned to us and told us in his stilted Spanish that the concert would go on as soon as candles were brought from a nearby restaurant. The waiters appeared with lit candles and the light flickered on the gold of the Churrigueresque altar called a retablo in Mexico. Such was the addition of the ozone by the storm to the usual oxygen- deprived Mexico City that a pipe I had placed in my suit pocket caught it on fire and the laughter I was met with was reminiscent of my Alice Cooper blooper. My introduction to period performances happened in 1996 in Vancouver’s Ryerson Church with a concert by the Pacific Baroque Orchestra that featured Vivaldi’s Gloria RV 589 in D major. I had known before the difference between baroque string instruments and modern instruments from one of the masters, John Eliot Gardiner who in 1989 briefly led the CBC Vancouver Radio Orchestra. I have been a fan of anything baroque since. Going to Early Music Vancouver’s presentation of Tafelmusik’s House of Dreams at the Vancouver Playhouse this past Friday was a striking and most welcome reminder of why I love this music and why the 19th century repertoire by orchestras dressed in monkey suits does not appeal to me much anymore. If anything I find that the only viable comparison to baroque music (and especially the current trend of featuring composers of the early 17th century) is new music. 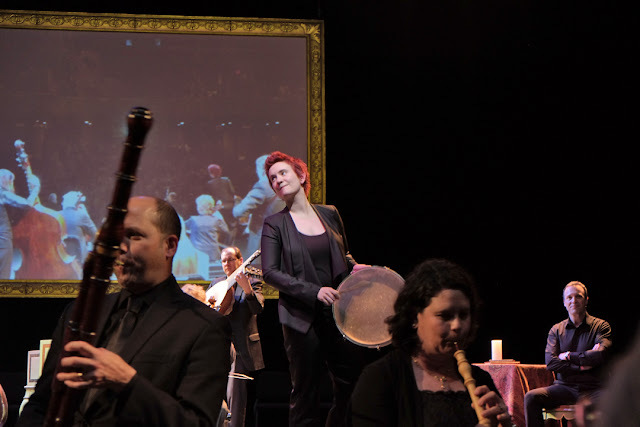 The Vancouver scene for new music is excellent and judging by the sold out performance of Tafelmusik we have a good thing going in our fare and often not so boring city. By the end of the 20th century the term multi-media was so hackneyed that the term ceased to be used. I find no other way to describe Tafelmusik’s inventive (not hackneyed in the least!) program that featured projection, what to me was a choreographed movement of the performers and a charming narrator called Blair Williams. His description of the importance of flax in Holland and how it was used for linens, for canvasses and even to make linseed oil for mixing oil paints was illuminating to me. In performances past of Tafelmusik I always loved the presence of oboe player Washington McClain (died in 2013) who played a softer foil to Tafelmusik Artistic Director and first violinist Jeanne Lamon. I saw her as an almost (but not quite) martinet. My views on her have suddenly changed! I am very happy to report that while I sadly feel the passing of McLain, Lamon smiled and gave lots of room to the other violinists. I was charmed by her. The rest of the orchestra was lively, they obviously loved what they were doing and the program that featured music by George Frideric Handel, Antlonio Vivaldi, Jan Pieterzoon Sweelinck, Marin Marais, Johann Sebastian Bach and Georg Philipp Telemann was played without a sheet of music in sight! It was most pleasant to note that our local lute player, Lucas Harris now has a good gig and to watch him play most of the time standing up was wonderful. But best of all were the violinists Aisslinn Nosky, Cristina Zacharias and Julia Wedman (who most of the time plays with a constant smile and her eyes closed) who played my fave work of the evening, Purcell’s Fantasia in 3 parts upon a ground. One reason is that I love all chaconnes, passacaglias and bass grounds. My close fave was Marais’s Chaconne in which the two cellists, Christina Mahler and Allen Whear “rocked”. It was a 2009 performance of Electric Company's Studies in Motion - The Hauntings of Eadweard Muybridge that spoiled me forever with the idea that the arts cannot be pigeonholed into separate categories. The Classical Greeks never did that. The Hauntings of Eadweard Muybridge brought the collaboration of noted Vancouver choreographer Crystal Pite. 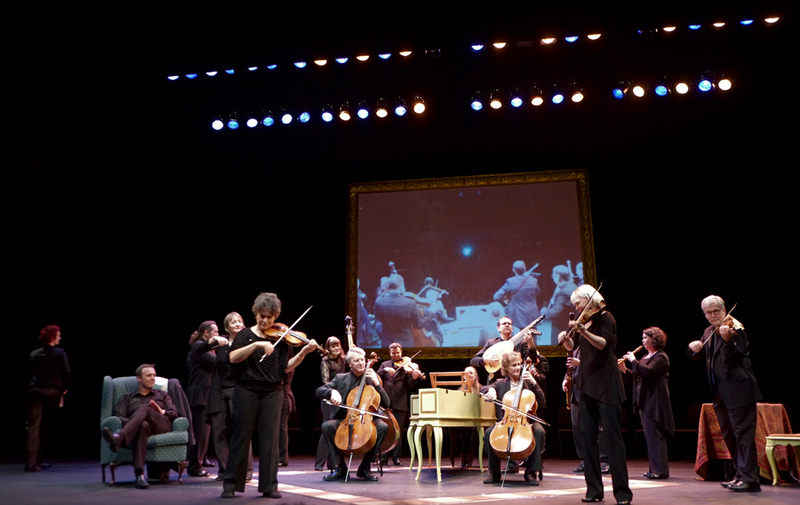 I saw wonderful choreography in Tafelmusik’s House of Dreams. Musicians walked around and their gestures were warm and inviting. 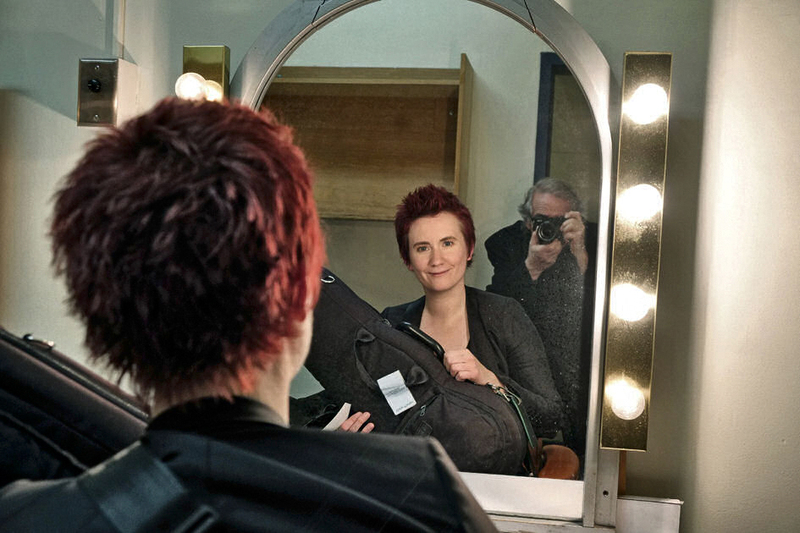 The one who topped all this was violinist Aisslinn Nosky with her electric red and spiky hair and a wide smile. I demand more and I would suggest that bassist Alison Mackay, who conceived, programmed and scripted House of Dreams look up Alejo Carpentier’s novella Concierto Barroco (the same name in the English translation). I would love to see how Blair Williams would handle the protagonists present in a Venetian Carnevale. 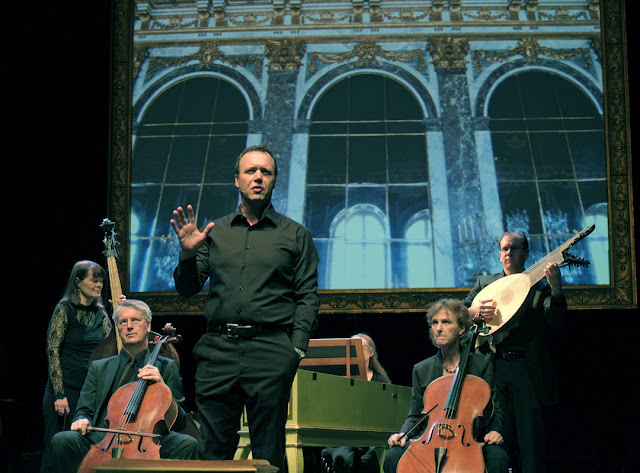 Link to: Tafelmusik's House of Dreams ¡! ¡! ¡! ¡! ¡! ¡! ¡! ¡! ¡! ¡! ¡! ¡! ¡! ¡! ¡! ¡! ¡! ¡! ¡! ¡!